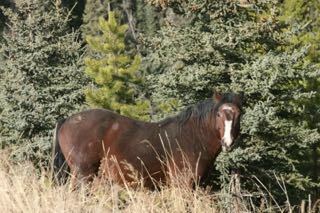 October is nearing an end, but the fantastic fall weather continues here in central Alberta and Alberta Mountain Horse country. The dry and warm conditions are allowing the horses to forage easily and therefore they are being able to build up their body condition and fat. For any animal living in the wild this is an important requirement for survival of the winter season yet to come. At this time of year the cattle have been removed from the leases and the horses have started to come together moving into their wintering areas. 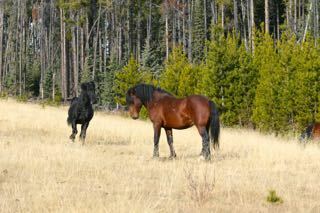 With no bugs to bother them and with less activity out there, the horses are taking advantage of this time. These two young boys have just finished rolling in a mud hole and were on their way to pester a mature herd stallion. In the summer these rolls in the mud help to keep the insects at bay. At this time of year, they roll in mud to help condition their coats. In the regrowth of the clear cuts the replanted young trees help protect the grass from the early frosts, keeping it delicious and green. This young stallion is taking advantage of this fact. 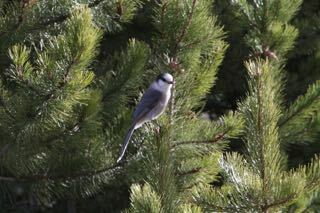 While photographing the boy above, this Canada Jay came right up to the tree next to me to see what I was doing. As the different herds come together, they also attract the bands of young bachelors. This group of six came running toward us. This family, which included ten members, took advantage of the warm sunshine and abundant forage in this clear cut. In our travels this day we were fortunate to encounter over a hundred head of horses. They were all looking in such good condition, which makes us feel good too. At this time of year, the young bachelors will often be found tagging along close to family herds. They do this for safety and with hopes of maybe getting themselves a girlfriend. Here one young stud is being told that he is close enough and back off. 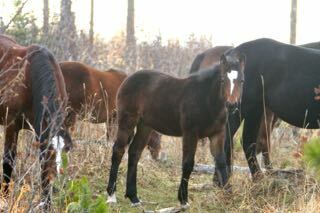 In this photo the mature black stallion had just one mare and the bay boy thought that it should belong to him. It was amusing to watch the interaction between the two. All it took was for the black stud to wheel around and the bay got the message and trotted off. Usually confrontations between stallions is mostly bluffing and posturing with little damage being done. If you look closely though you can see the battle scars on all these boys. 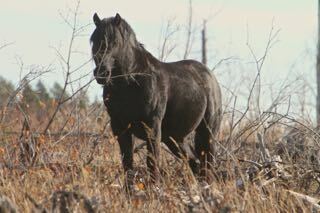 The beautiful black stallion so exemplifies the ruggedness and wildness of our Alberta Mountain Horses. 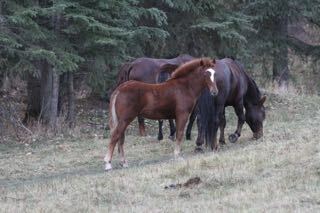 We enjoy seeing him with his herd every time we go out to visit the horses. What makes us feel good when we observe the horses, is to find the foals growing so healthy and strong as you can see in the photos above. This will certainly help them when winter snows arrive. When we were out taking these photographs, it really pleased us to see this three-year old stallion. We immediately recognized him due to his facial markings. The first time we saw him he was just a couple weeks old and we saw him several times that summer but had not seen him since. So to see him that day was just a bonus. WHOAS continues to work on our projects for the longterm protection of these magnificent animals. We encourage you to lend your support and one of the ways you can do this is to purchase one of our calendars. The calendars contain 15 photos of the horses throughout the seasons with narratives accompanying each picture. Click on the Purchase Calendar at the top of the page to purchase one online. You can also mail in your orders. The calendars cost $25 each which includes postage and handling with all proceeds going toward our work with the horses. What a stupid thing to kill those horses. Does Alberta not realize what a natural resource they have!!!!! Take care of them and feed them. One day day when there are none left Alberta will be sorry. Wish we had them in Maniroba. What a gift of life. Personally, believe the cattle ranches have Govt in back pocket. Spread the W5 episode as much as u can.